Our lovely stone cottage is set on 6 acres of native Australian bushland. The house is positioned on top of the hill in the heart of Chewton Bushlands and provides amazing views across to Mount Macedon and Mount Franklin. Enjoy your days and evening looking out to the views and on those cold nights snuggle up in front of the fire. Ukamirra is "off the grid" with solar power, tank water and gas hot-water (like most properties in Chewton Bushlands). The cottage is made of stone from the property and is set on a large platform featuring native Australian plants. There are two bedrooms, both with queen size beds. A comfy lounge and separate kitchen/dining areas with everything you need to cook up a wonderful dinner party. We share our land with the local wildlife, so you can expect kangaroos and many native birds on the property. This is a gorgeous, private and quiet place to relax and unwind and you are welcome to roam. The property has TV, DVD, WIFI, board games, Netflix, BBQ (gas), wood burners (lounge and kitchen), indoor and outdoor seating (6 seater options). Given we are off the grid and on tank water, guest are requested to bring their own linen (i..e, fitted sheet, doona cover, pillow cases, towels). There are pillows and queen size duvets on each bed. During summer the house stays relatively cool given the stone construction and each room is provided a pedestal fan. There is an old oak tree on the platform that provided the perfect spot to take shelter from the sun for breakfast, lunch and dinner. All doors and windows have fly screens. Castlemaine and Chewton are 10 minutes away with many coffee shops, restaurants, pubs and boutique stores with plenty to see and do. A great area for bushwalking and bit of outdoor activities. There is always the Saturday market in Chewton and many others throughout the region. Tea towels, bath mat and hand towels are provided. The lounge and kitchen have a wood box heater and there is always plenty of wood. We have NBN - so nice fast internet. Living room has a three seater lounge and two single seaters. The kitchen has all the cooking equipment you need for a family feast. The dining table comfortably seats 6 people. There is a flat screen TV with access to Netflix. There are BOSE speakers to play your tune from your iphone. There are a few board games for evening entertainment. There are a selection of DVD for those cold winter nights. There is a six seater outdoor table with bench seats to enjoy the view and meals. We had a wonderful long weekend relaxing in total privacy. Everything we needed was available. Can’t wait to go back again sometime. Would highly recommend this property to anyone wanting to get totally away from the hustle and bustle we call life. Thanks guys it was amazing. We spent 2 nights here as 4 adults and loved our time. The fires kept the place nice and cosy and we had a great time cooking in the well equipped kitchen. Castlemaine is only a short drive and Chewton has its on a Saturday market. Would definitely return! Fantastic views from a beautiful cosy cottage. Very peaceful location and well appointed property. We throughly enjoyed our time although not long enough. Sat outside in the sunshine listening to all the birds and at night star gazing which was amazing. James was very helpful and supplied with great information on the property itself and the surrounding areas. Close, easy drive to Chewton main street and Castlemaine. Thank you. We had such a wonderful time at this cute cottage in the woods. 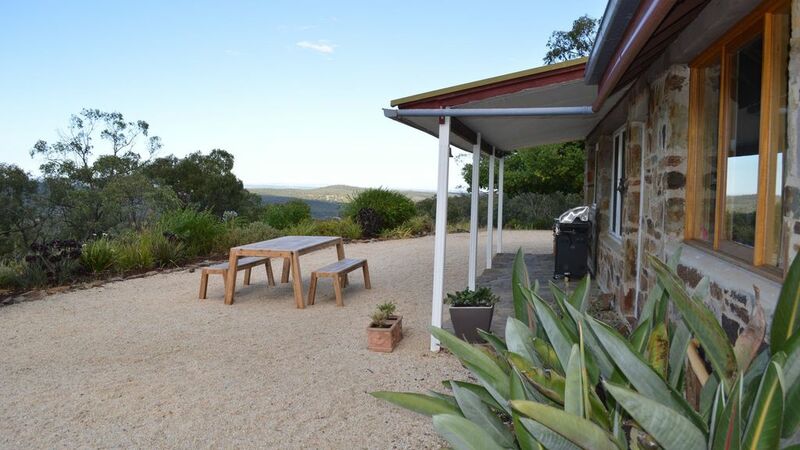 Gorgeously furnished & cozy, pretty gardens, spectacular views & great bush-walking tracks. Especially love the stained-glass window in the kitchen that casts rainbows in the morning! We absolutely enjoyed ourselves & will definitely be back! Thank you!